There’s no denying that Shakespeare’s “Richard III” is an exciting, sinister and excellent work of literary fiction. But that is how it should be regarded – as fiction. It must be remembered that “Shakespeare” could well have been the pen name for Lord Oxford or some other highly educated, well-travelled noble who was close to the royal court of the day – and that court was Tudor! 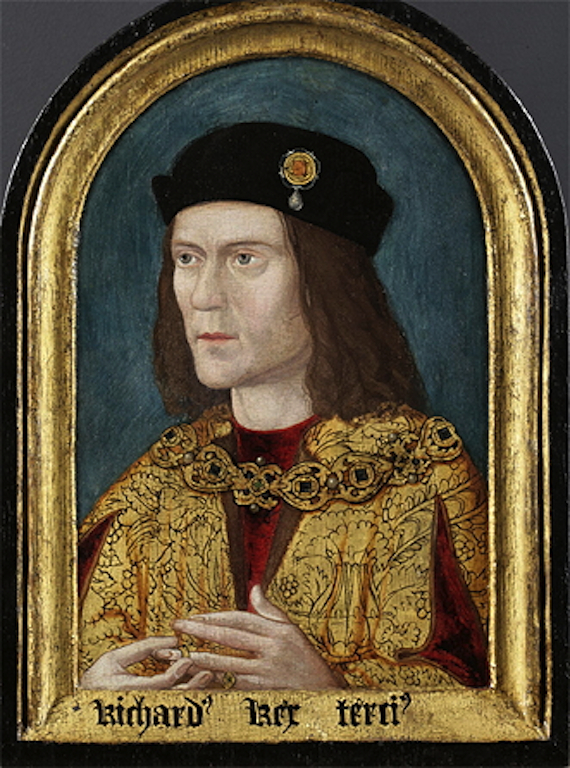 So now we have two mysteries: Who was the REAL Richard III and – who was the REAL Shakespeare? Fascinating stuff! Personally, as a Ricardian, I have always believed that Richard has been grossly misrepresented in our history thanks to the Shakespeare play. Perhaps things will change now. You might want to change the third illustration–that’s the Folger Library edition of Richard II, another reviled king, yes, but the wrong Richard. Thank you Emma, We’ve fixed. I have read that Lord Farquaard was deliberately designed to resemble Richard from his portraits. So many fascinating concepts to explore with Richard III, including the historical equation of deformity with villainy, or the deformity which removes one from access to sexual pleasure and/or love and affection–both in the play and in reality. Now that we have seen Richard’s actual twisted spine, it makes us consider his determined bravery to do his own fighting while in tremendous pain, increased by the weight of his armour. I hope we come to know about him. As evil as he might have been, he will never be as bad as Henry VIII! I m too late for a coffee … am I :( ??? If con artists were smarter, they’d let people forget previous deeds first. Little more than two years after the James Frey debacle, the literature world is once again awash in breaking news stories of fabricated memoirs.The New York Times reported Monday that Misha Defonseca’s Misha: A Memoire of the Holocaust Years is complete bogus. This must be cardinal sin considering that, according to the AP, Defonseca is not even Jewish – real name: Monique De Wael. So, never mind that the “memoir” was translated to 18 languages and made into a feature film, exploiting people’s shock and disgust for a handsome profit. The defense? “The story is mine. It is not actually reality, but my reality,” says Defonseca.Today, the NYT reports that Margaret Seltzer’s gang memoir, published under the name Margaret B. Jones Love and Consequences – where the author purports to be a half-Native American, half-white girl dealing drugs for the Bloods in Los Angeles – is also, ahem, a fake.Add to it the revelations about self-knighted chef Robert Irvine of the Food Network – author of Mission: Cook! – who beefed up his resume to include fictional positions as White House Chef and personal friend of Prince Charles (who picks Charles as a mate anyway?) and you might think non-fiction these days is only as real as Frank Abagnale’s Harvard Law degree (Remember Catch Me If You Can? ).What is most shocking in Seltzer and Irvine’s cases is the lack of fact-checking. If it were not for Seltzer’s sister – who alerted the publisher, Riverhead Books, after reading a profile of Seltzer in the NYT – Love and Consequences could have enjoyed some success. Look at Irvine, he even had a TV show.Finding out if the Queen knighted someone should be fairly simple. Finding out the heritage of a person, where they attended school, how many siblings they have and so forth is extremely easy. One would think that after Frey, publishers would take a closer look to the facts in memoirs and make sure that readers don’t end up paging through imaginary non-fiction.On the plus side, Seltzer must be quite a writer and actress – after all, she managed to keep up the guise of truth for three years while working on her, err, novel.